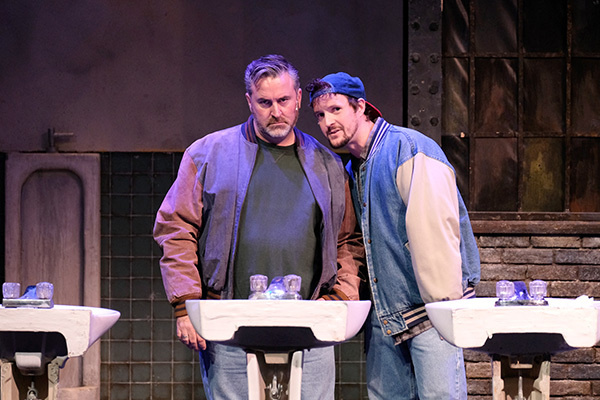 San Diego Musical Theatre celebrates its 10th anniversary with a return to their debut show — “The Full Monty” — which, coincidentally, got its start in 2000 at San Diego’s Old Globe Theatre. Those steel-drivin’ strippers from Buffalo will now go through their paces through Feb. 25 in their new digs, the Horton Grand Theatre in the Gaslamp Quarter. You remember the plot, based on the 1997 film: Six steelworkers in Buffalo get laid off and find themselves home, playing househusband — and feeling like “Scrap” — while their wives go out to work. 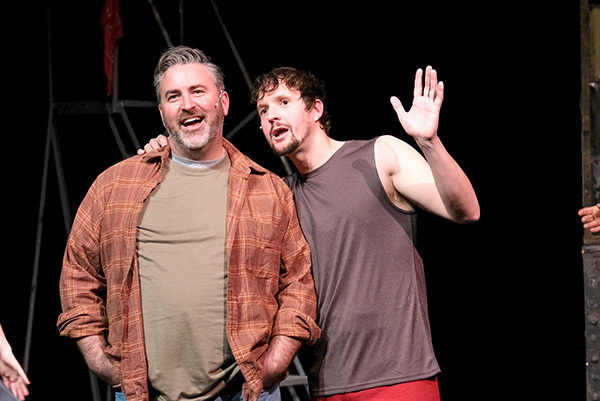 The major players are Jerry Lukowski (Steven Freitas) and Dave Bukatinsky (Danny Stiles). Jerry is separated from wife Pam (Amy Perkins) and in arrears on child support payments, to the point that Pam has taken their young son Nate (Owen Schmutz) and moved in with richer boyfriend Teddy Slaughter (Alex Nemiroski), leaving her and Jerry with barely a civil word to say to each other. Dave’s problem isn’t wife Georgie (Joy Yandell), but the extra pounds that have made him so self-conscious that he hasn’t even approached Georgie in months. The search for jobs proves fruitless. One day, Jerry sees a bunch of local women excitedly lining up to pay $50 to watch the Chippendales — and the thought dawns that a one-night show featuring steelworkers as strippers might save their hides, or at least pay the rent for a month or two. It’s a crazy idea, right? But hey — if you can’t beat ’em, join ’em. Now to recruit dancers. Auditions (and rehearsals) are a hoot and so is Devlin as accompanist Jeanette Burmeister, a down-to-earth theater broad who’s seen and heard it all and has a wisecrack for every occasion. Joy Yandell play’s one of the steelworker’s wives. The only applicant with any dance experience — Harold (Richard Van Slyke) — reluctantly agrees to take on the job of teaching the quintet how to do it, though his experience is in ballroom dance. There’s also lonely Malcolm MacGregor (Jonathan Sangster), in his own words “a complete loser who still lives at home with his mother Molly” (Amy Perkins). The good news is that one night he finds friends in Dave and Jerry when they rescue him from a suicide attempt. The better news is that he auditions. Then there’s Ethan Girard (Jack Eld), who cheerfully admits he can’t sing or dance, but causes general gasping when he displays other attributes. But how to compete with those Chippendales hunks? Clearly, these local steel-drivin’ men will have to get a gimmick. How about going the full monty? 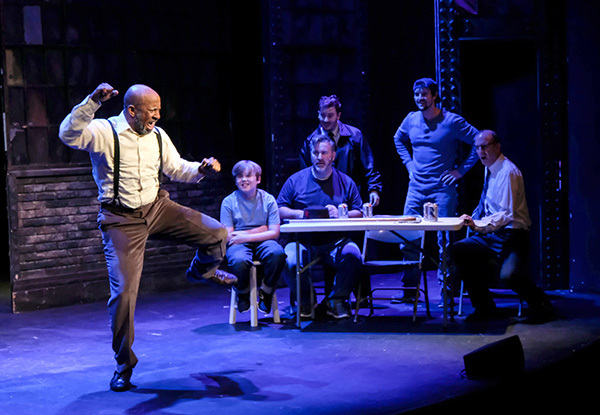 The show (nominated for 10 Tonys) works because of Terrence McNally’s charming, funny, sometimes even poignant script, David Yazbeck’s music and lyrics and the sheer humanity of these characters, just trying to get through life and pay their bills. The versatile rented set allows Director Neil Dale to keep the action going, and Kevin Anthenill, Michelle Miles and Janet Pitcher contribute fine sound, lighting and costumes. And the invisible 12-member band performs mightily, under the fine direction of Don Le Master. 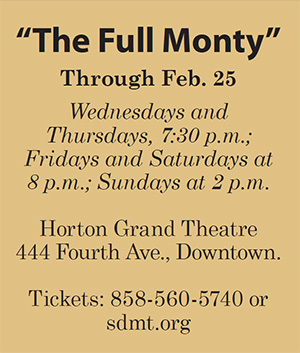 “The Full Monty” makes no claims of profundity, but it’s an amusing, energetic production with a message that is still relevant.